Producer Dmae Roberts presents an encore broadcast of her documentary profile of legendary author Ursula K. Le Guin. The author of 40 plus books, Le Guin is a much gifted and prolific writer much loved by fans around the world. 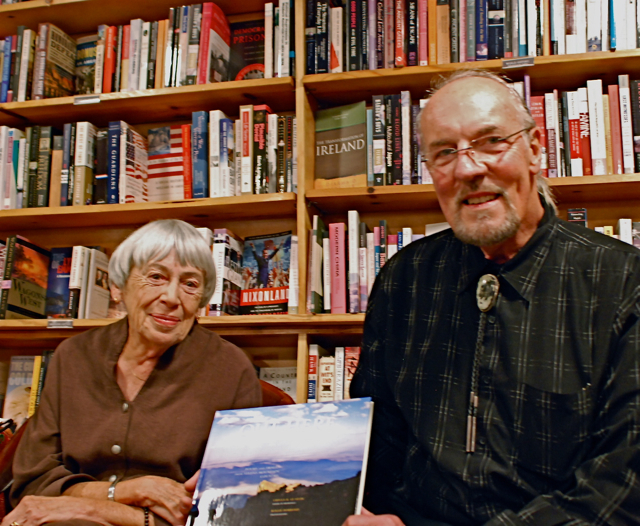 And in this half hour Oregon Treasures special on December 7th at 11am on KBOO 90.7 FM, Le Guin shares thoughts about her work and the Oregon landscapes that have inspired her. This show originally aired on November 2, 2010. Best known for her literary science fiction and fantasy books, Le Guin crosses all genres. She recently published a book of poetry and drawings with photographs by Roger Dorband. They are doing a series of readings which started with a book launch at Looking Glass Books in Sellwood. 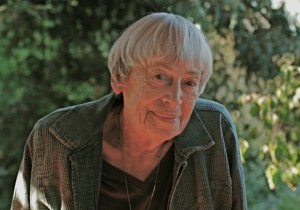 Roberts also visited with Le Guin recently at her home to talk about her works and career. 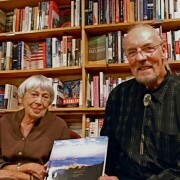 Dmae also attended a book party for “Out Here” at the Looking Glass Bookstore. Le Guin said it was the very first book launch she’s ever had. Oregon Treasures is a special series with funding by the Regional Arts and Culture Council. This year long series produced by Dmae Roberts brings to light veteran arts organizations and artists who have made an impact for several decades on the artistic landscape of Oregon. Throughout 2010, Stage and Studio will air these creative feature stories and highly produced half-hour specials of lengthy portraits.